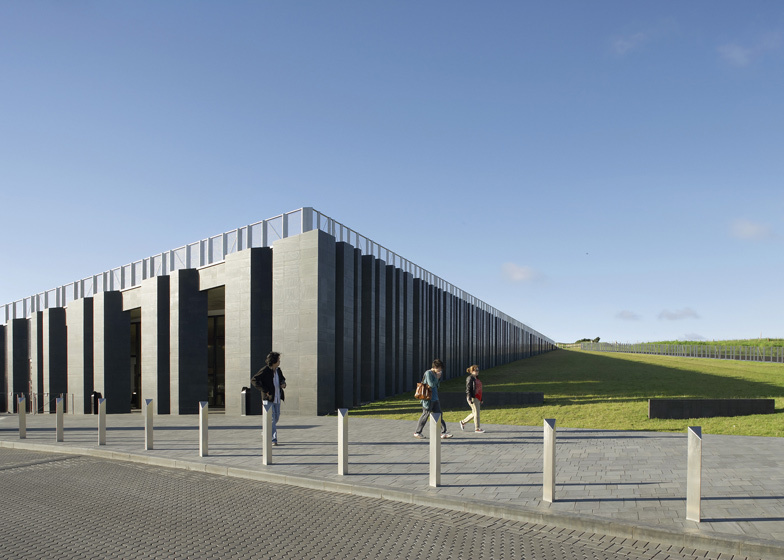 The stone mullions surrounding this visitor centre by Irish firm Heneghan Peng Architects imitate the towering basalt columns of the volcanically formed Giant's Causeway (+ slideshow). Created around 60 million years ago by the movement of basalt lava, the causeway is the most popular tourist attraction in Northern Ireland and comprises over 40,000 columns that step down from the foot of the cliff into the sea. 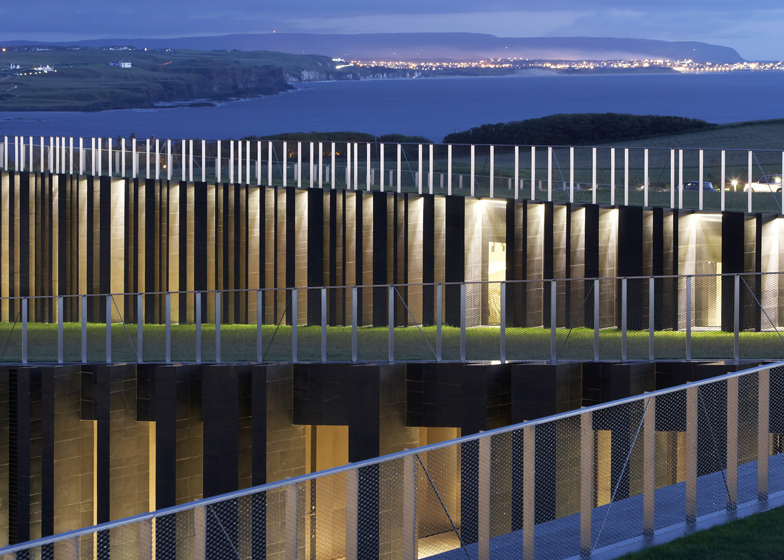 Heneghan Peng Architects won a competition in 2005 to design a visitor centre for the Giant's Causeway, providing exhibition spaces, a cafe, toilets and a giftshop. 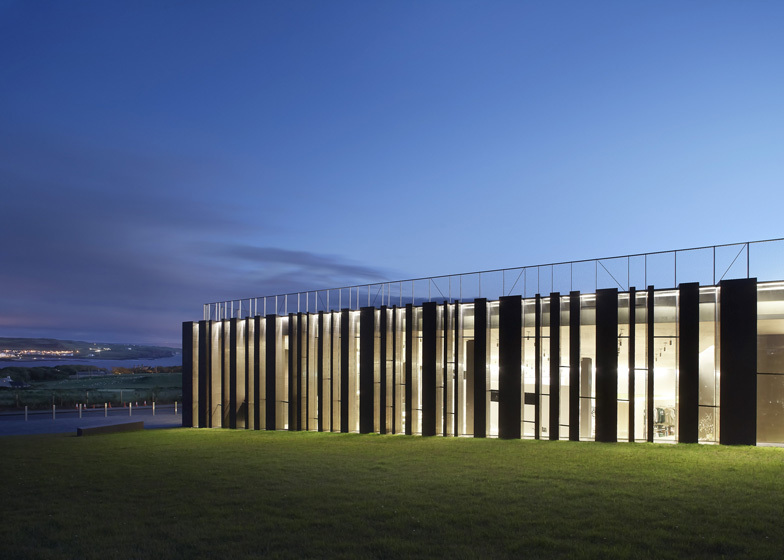 The new building opened this summer and is described by the architects as "two folds into the landscape". 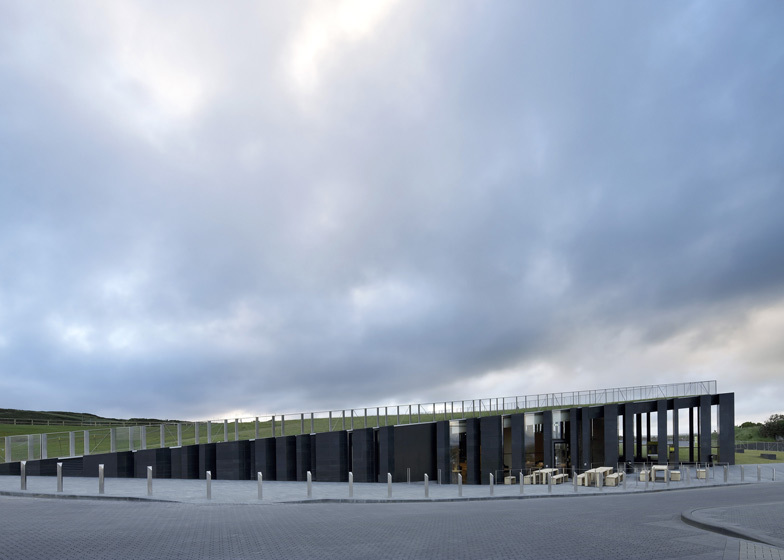 The first fold rises up from the ground to create a building with a sloping grass roof, while the second angles down to form a car park and entrance that meets the level of the approaching road. 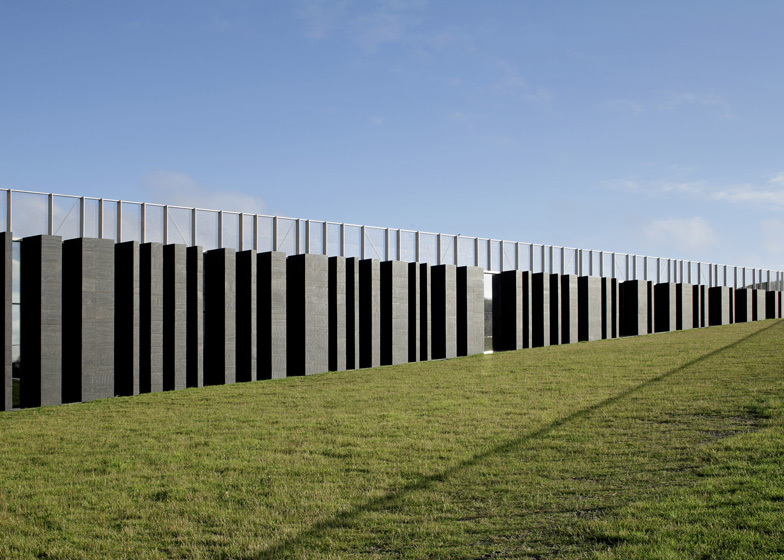 "It is a carefully sculpted intervention," say the architects. "It is both visible and invisible; invisible from the cliffside yet recognisable from the land side." 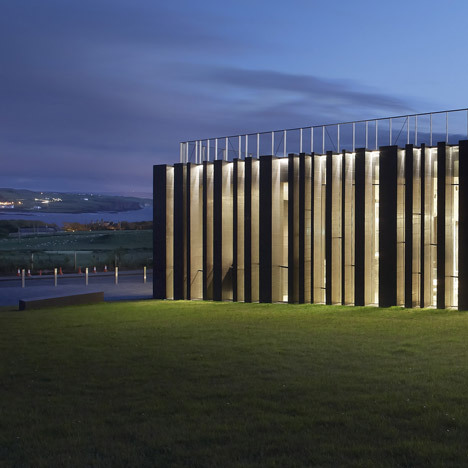 Between each of the stone mullions, vertical windows line the walls and surround a cafe that overlooks the coastline from the far end of the building. 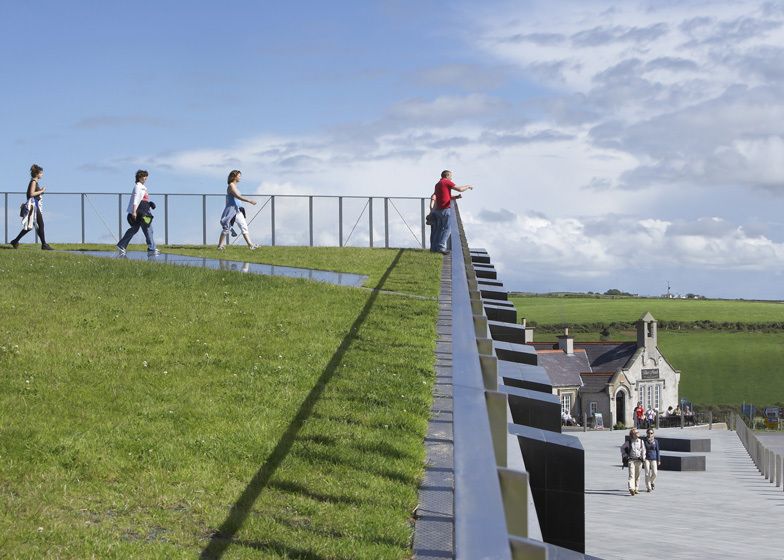 Visitors can climb up over the grassy roof, where skylights let them peer down into the exhibition spaces. Floors inside the building are staggered to negotiate the sloping site, but ramps connect each level. Other projects at natural landmarks include the installations along the Norwegian national tourist routes. 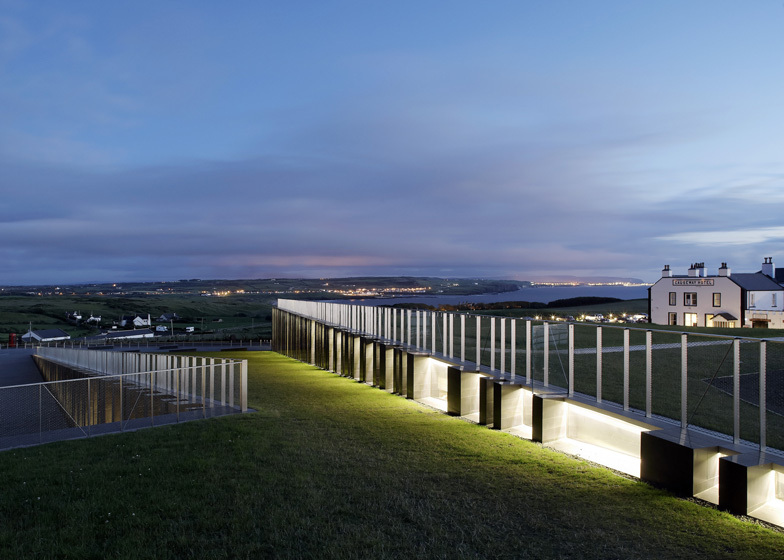 The project is located at the ridgeline of the North Antrim coast at the gateway to the UNESCO World Heritage Site. 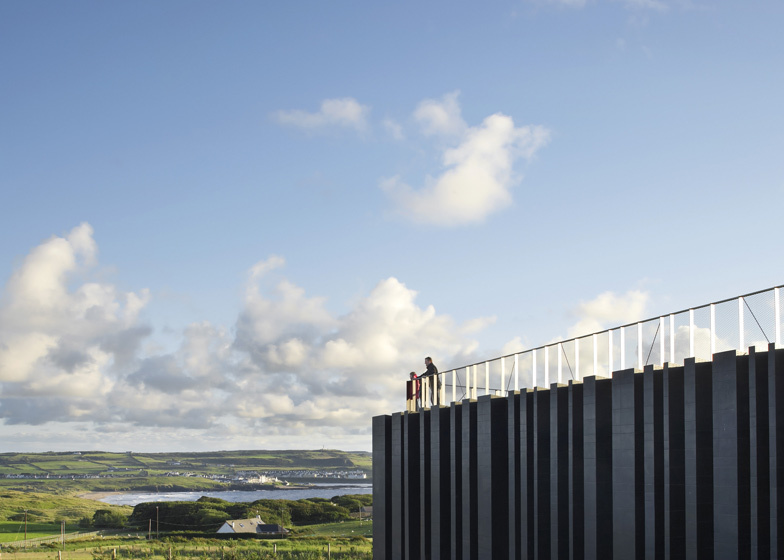 The proposal for the new visitor facilities can be understood as two folds into the landscape. 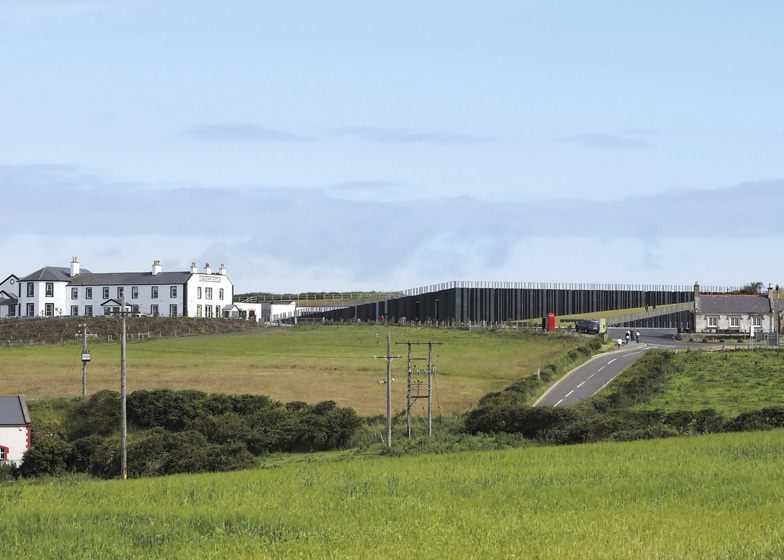 One folds upwards revealing the building and the second folds down to form the carpark and shield it from view of the approach road and coastal path. Between the two folds, a ramp leads to the coastal ridgeline which is restored at this location. 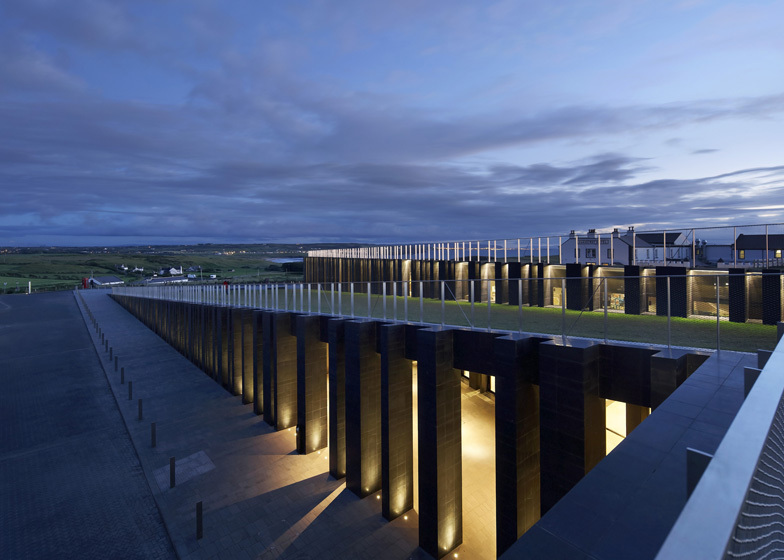 The visitor’s centre at the Giant’s Causeway is experienced as an event along the route to the Causeway and the coastline. 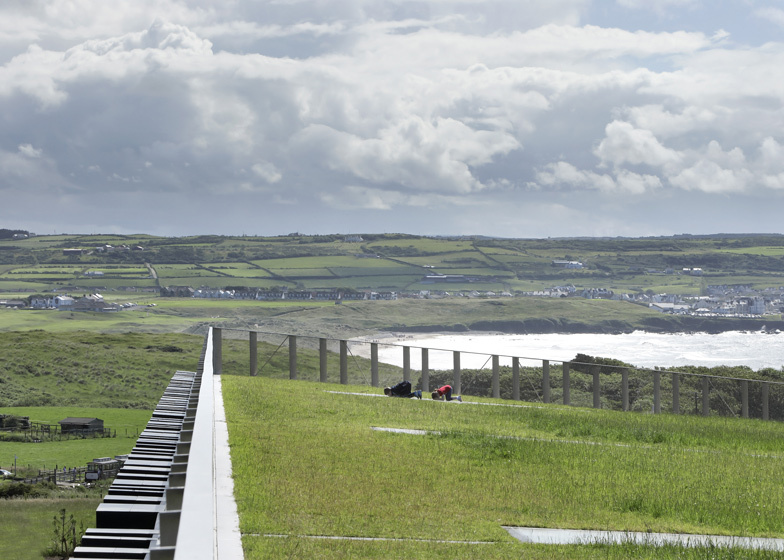 It is a carefully sculpted intervention into this landscape which is both visible and invisible, invisible from the cliffside yet recognisable from the land side. 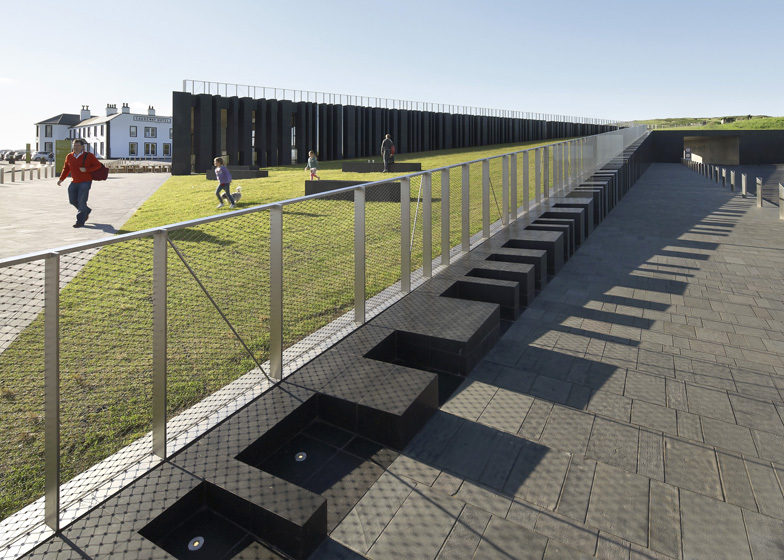 Internally the building can be understood as a series of stepping floor plates which are linked by a series of ramps. 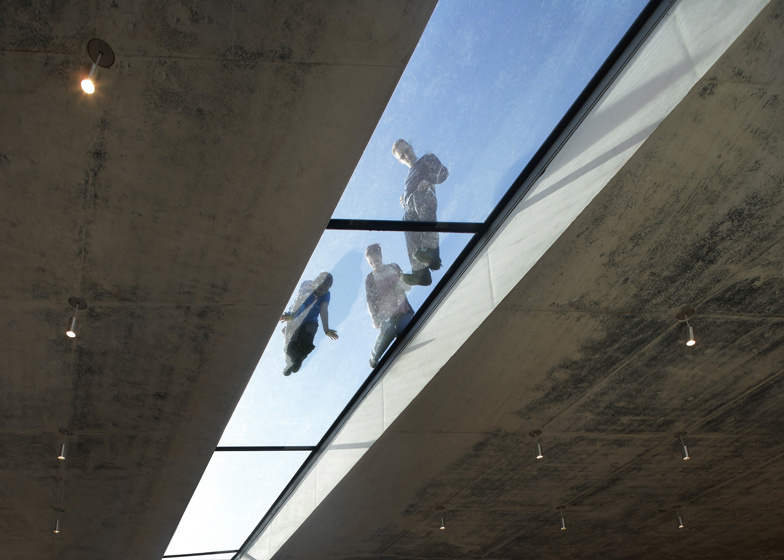 These floor plates allow the different activities of the building to flow into each other creating a fluid movement through the building for the visitor. The folds are precise and geometric yet vanish into the patchwork that forms the tapestries of fields. The architectural expression of the edges of the folds is singular, stone mullions that echo the columnar landscape of the Causeway site. 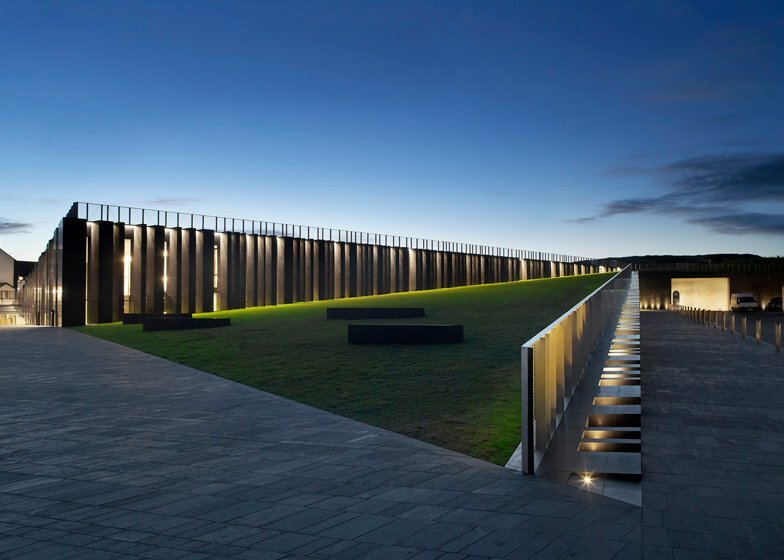 The strategy for the building creates a space between the basalt and the folded plane of the grass roof; a space formed within the materials of the site. 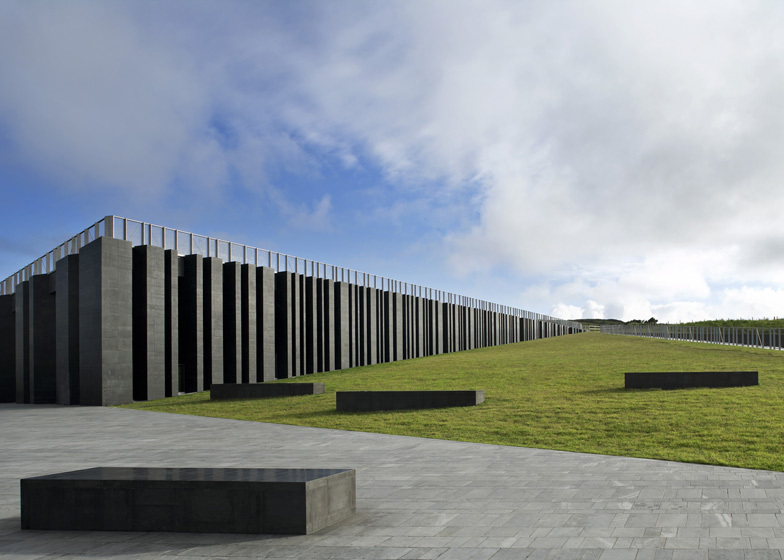 The basalt edge is formed as a weave between basalt stone columns and glazing where changes are created in transparency and opacity along the visitor’s route. What belies this simple façade concept is a carefully engineered solution which evolved around the inherent properties of the locally sourced basalt stone. The project’s design has received a BREEAM “Excellent” rating. Project Design & Construction Stages: Shih-Fu Peng, Róisín Heneghan (Project Directors), Julia Loughnane (Project Architect), Monika Arczynska, Jorge Taravillo Canete, Chris Hillyard, Kathrin Klaus, Carmel Murray, Padhraic Moneley, Catherine Opdebeeck, Helena del Rio.